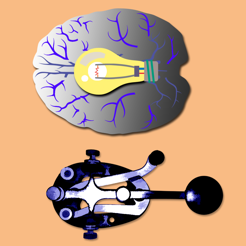 Audio learning can be a great brain exercise. 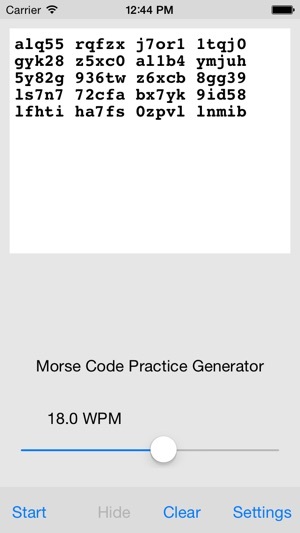 This is a Morse Code practice test generator which can generate random 5-letter words, and send them in International Morse Code using your iPhone speaker. The WPM (words per minute) speed can be easily set. 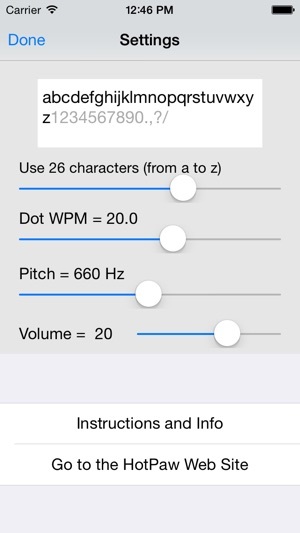 You can independently set the dot speed (for the Farnsworth method), and tone frequency. You can also configure the number of possible letters and numbers used, as well as customize the sequence of letters and numbers from which the test words are generated (for training similar to the Koch method). You can either show or hide the test words as they are sent. 100 letter (20 5-letter words) are generated at a time, making it easy for you to score the percentage you've learned to copy correctly. Other Morse Code applications by HotPaw Productions in the App Store include MorseDecoder, MorseKey, and Text2Morse. Minor bug fixes for recent OS versions. I have been waiting to see how long it was going to take someone to publish a manual morse trainer. Just getting started, so there could be a bug somewhere but so far it is well designed and gives you a good deal of control on setting parameters. It is ironic to be learning MM on such a well designed Internet device - but MM still has it's place for reliable comms. A wonderful trainer for the youngsters who may be interested in learning MM - it certainly takes the pain away. This app will be very helpful in getting my skills back. However, at higher speeds, if you try to copy individual letters without being able to hear common digraphs, trigraphs, and words, you'll hit a big wall. Gordon Brown's tapes didn't teach that way for the 20 WPM test. I don't think it's going too far to say that random letters, at higher speeds, are limiting. Don't get me wrong -- this is a very useful app, and I think it deserves four stars. The author should look up the "Dissociated Press" novelty text generator. 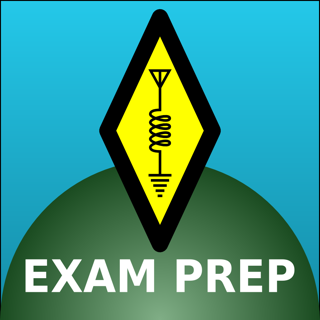 He can take a bunch of text from QST, or from typical QSOs, to build a table of which letters, probabilistically, follow single letters or pairs. "Playing back" the latter can generate very plausible, but random, text, with the "right" numbers of "th"es and the like. If he can work that in, this program would deserve six stars, and $3.99. Solid 599 for this portable, customizable CW trainer. Great for turning down time into practice sessions, I like to use it on airplanes especially. 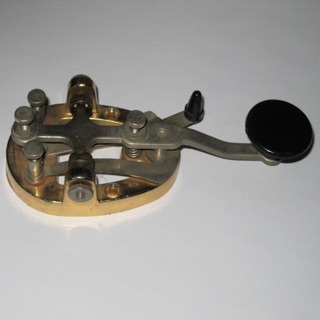 This has been one of the tools that helped get me from 5 to 20 WPM in spite of the sunspot drought! As a ham, it's one of my favorite iPhone apps.